North just had three concerts in the space of a week. The first two were at Highwood Theatre and the last one was with the Montgomery County Middle School Honors Chorus. 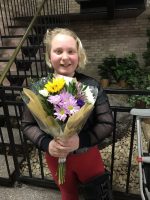 Every month or so Highwood has an event called Fine Arts Night, which serves as a preview of songs and scenes from upcoming plays as well a talent show for the kids who act there. North’s not in a show at Highwood right now, but they were set to give a solo concert just two days later and one of the administrators suggested they sing one of their concert pieces at Fine Arts Night, as practice and to promote their concert. It was a good idea, even if it did come only one day before Fine Arts Night. North’s pretty game for this sort of thing, though, so they said yes. The solo concert was an opportunity they won at an fundraising auction for the theater last fall. After a period of enthusiasm, they had cold feet for a while, especially when the friend who agreed to perform with them backed out. But they had a few coaching sessions at the theater to go over logistics, rehearse, and get performance feedback, and that helped. I enjoyed the first half of the song, but there was an Improv Night going in one of Highwood’s other performance spaces, right next door, and in the middle of the song, it got noisy over there and it was hard to hear. North assured us afterwards that at the solo concert, there would be a mike. Sunday afternoon we were back at Highwood. I wasn’t sure how many people would come and I was a little nervous about that because while the theater promoted the show on its Facebook page, North hadn’t told too many people about it. But there were ten or twelve people in the audience (including Beth, Noah, and me). A friend of North’s from Tri-M was there, plus North’s friend (from elementary school, Scouts, and basketball) Leila and her mother and brother, and the rest were Highwood friends. While people were filing in, Noah set up his camera to film the concert. Of the originals I liked “Forget” best and this time I got to hear the whole song, though of course “Chasing Stars” will always be close to my heart because of the video. Of the covers, I liked “Hallelujah” best maybe because they’ve been noodling around with it since last summer and I’ve been able to hear it develop or maybe just because I really like Leonard Cohen. I thought the Presley tune might be a hit with the grandmothers, though, when they see the video. 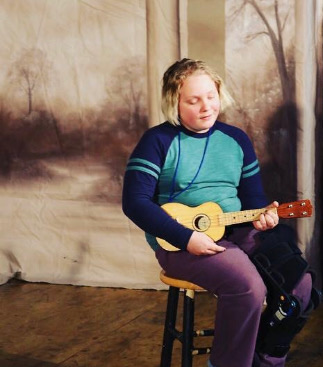 Here’s a lyrics video Noah and North made for “Trampoline” over the Thanksgiving weekend and winter break and a clip of North singing “Forget” and “Hallelujah” at the concert. They’re about a minute and a half and seven minutes long. After it was over Leila’s mom said to us, “I look forward to hearing North’s first album,” only half-joking, I think. 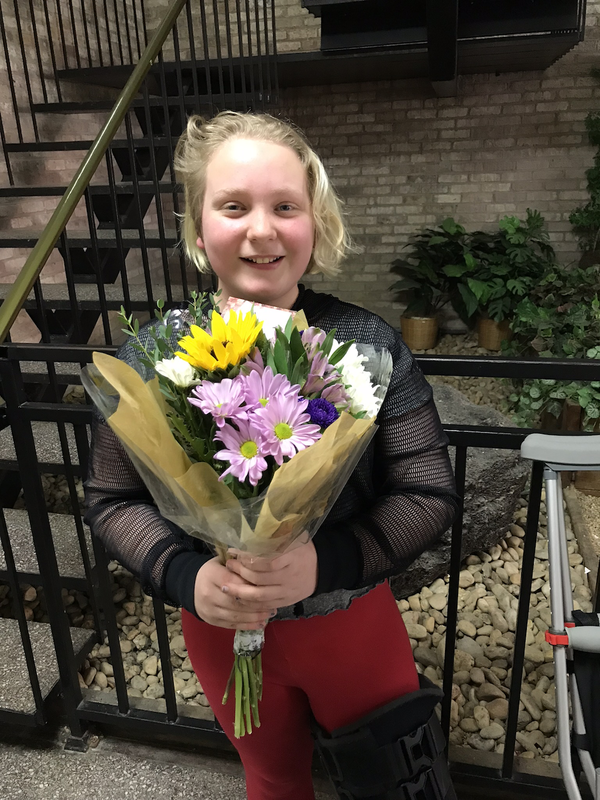 Afterward, we presented North with a bouquet from Beth’s mom and their friends crowded around them in the hallway and said the kind of things theater kids say to each other after a show. If you were ever a young performer, you may know what I mean. Sadhbh asked if she could take North out for tea at a café down the street and then over to her house and that’s what they did. 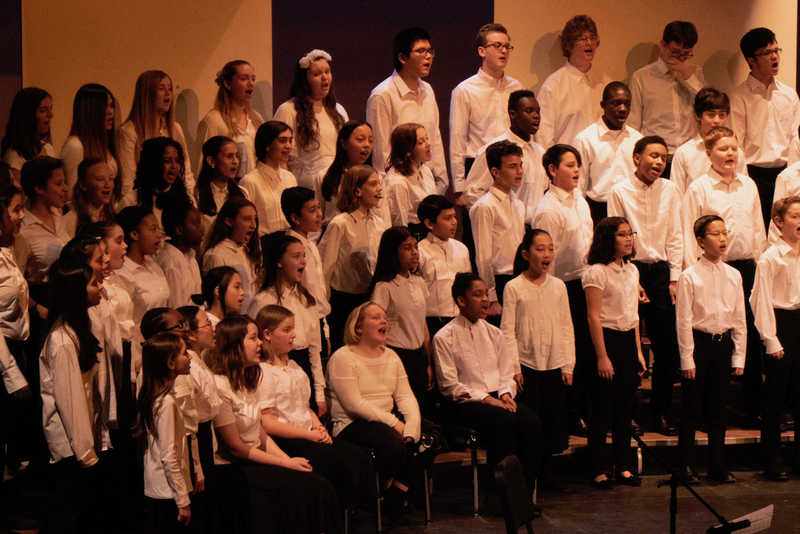 Just like last year, the county Honors Chorus concert had two weather-cancelled practices, so they had only six rehearsals instead of the planned eight. I guess if they really want eight rehearsals it shouldn’t meet in January and February. The concert was at 7:30 but the singers were supposed to arrive at six, so I fed North a frozen pot pie at 4:40, and then they got into their black and white clothes and we hit the road a little after five. Montgomery County is a large county, and we live at the southern edge of it so the centrally located practices and concerts are always a schlep. While North was rehearsing, Beth, Noah, and I went out for Japanese at a restaurant that turned out to be a bit further away from the school where the concert was taking place than we intended to go, but we got back in time. The auditorium was large and set up in a steep amphitheater. North had previously complained about getting up and down those steps on crutches. Speaking of crutches, North told us right before we dropped them off that four of the sopranos were on crutches, all with broken tibias. The four injured singers came out first and sat on chairs in front of the risers and someone came and took their crutches away. The crutch-wrangler was busy throughout the concert bringing crutches back and taking them away because there was one song that was just tenors, basses, and baritones and one that was just sopranos and altos and kids kept exiting and returning to the stage, and re-arranging themselves on the risers. Another mobility complication was a song with a Zulu folk dance, which the kids did partly on the risers and partly on the stage in front of them. For that dance, those who were incapacitated stayed seated and waved their arms rhythmically. There were seven songs. One in Latin (“Dies Irae,” which is part of Mozart’s Requiem), the Zulu song “Amavolovolo,” “Dawn’s Awake,” (based on a poem from the Harlem Renaissance), a Spanish lullaby, “Crióme Mi Madre,” “I Sing Because I’m Happy,” (a gospel-style adaptation of the hymn “His Eye is On the Sparrow”), “I’ll Make the Difference,” and “Why We Sing,” which is the traditional closing song for honors chorus concerts. I can’t choose a favorite song. They were all lovely. The program explained the theme of the concert was different roles music plays in our lives: music as change, music as expression, music as hope, music as comfort, music as joy, music as inspiration, and music for all. Great to see these middle schoolers doing something they love last night. It’s not easy being a member of the honors chorus. Weekly practices were at a school that’s 45 minutes away, started at 7 and lasted an hour and 45 minutes after a long day at school. The directors pushed the kids hard. But each week North would leave practice happier than when they arrived, filled with the joy of working toward a common goal. So grateful for the teachers who work so hard and care so much about helping our kids learn and grow. During the concert, which will be our third of five school concerts this year (two band concerts and three chorus concerts), I had the startling realization that because Noah will be at college next year and North wants to switch their elective from chorus to art in eighth grade, next year there will probably be none. North’s been drawing and painting more recently, so it makes sense to take a class to explore that, but I will be a little sad to give up my seat in the audience after nine straight years of school concerts. Music has changed my kids, helped them express themselves, given them hope, comfort, joy, and inspiration. And listening to them play instruments and sing has given me those things, too. That’s why I hope Noah will continue to drum in college. And of course, North’s not finished singing. Chances are there will be musicals and maybe concerts outside of school venues in their future. I should have plenty of opportunities to see them in concert.